I was rather nervous but was greeted warmly at the registration desk. The speaker for the day also spoke to me and asked me if I was okay with fast-talking Japanese. I asked him to bring it on because part of my reason for being there was to learn Japanese through immersion. Change your posture when you think about being and becoming rich. To cultivate money, you must first invest in yourself. Have big goals or you will just keep making them smaller. “The bigger the why the easier the how.” Be clear with yourself about wealth creation. From now on, never say to yourself, “I am bad at math.” Rather, think of it as a game with which to live and play. Think of yourself as the manager of your money. 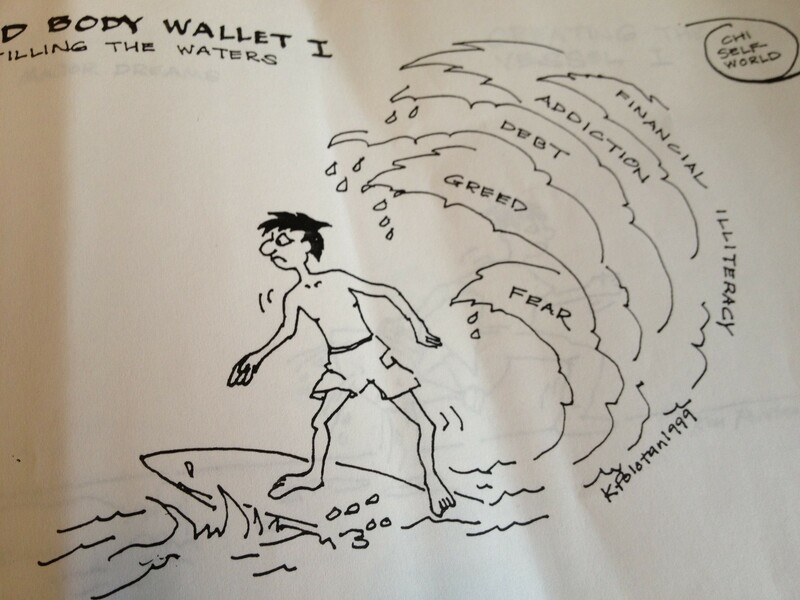 Keep a notebook of all your expenditures and investments. Keep a balance sheet of assets and liabilities and think of it as a scoreboard. Keep practicing your financial skills until it becomes natural like driving a car. After the two hour-talk, the host invited us to enjoy pizza, soft drinks, and beer. Additionally, the friendly staff of the Financial Academy distributed complimentary copies of the book, 人生が変わるお金の大事の話、An Important Life-Changing Talk About Money. We didn’t get a chance to talk for long but he suggested that I could learn more Japanese by reading his book. I’m all over that like white on rice! Stay tuned. I’m going to keep it short, because today is the big day that I go to the Money Cultivation Course. I want to pick up on a sentence from 1日３０分 that I copied as part of my ongoing process of learning Japanese. My dash of soy sauce interpretation: You don’t have to think of studying as something formal, ceremonious, or stiff. The key word is 堅苦しい (katakurushii) which means formal, stiff, literary, proper, and ceremonius. The first character 堅 means hard, rigid, stiff, uptight. The second character, 苦, means trouble, worry, difficulty, pain. In other words when you think about the word study from now on, don’t get your undershorts in a bunch. Change your mind or change what and how you are studying. (Change your undershorts regularly too–you never know when you might be in an accident.) Study can have a heavy connotation to it, but maybe the most effective studying happens when you become captivated by an issue or a process. School isn’t something that just happens in school. College dropouts like Bill Gates and Steve Jobs didn’t stop studying. They changed the focus of what they were studying and created new possibilities and technologies by doing so. Of course, you don’t have to be the next Bill Gates. Follow your interests, take little bits of time throughout the day for the subjects and skills that make your heart sing. Don’t worry, study. Be a samurai at play. Want to learn to save money in a relaxed manner. Want to learn how to save $300 a month towards investments. I’m not endorsing the course, but just by registering and reading the online materials, I feel like I’ve already gotten my $20 worth. (Also, I heartily support anyone who teaches people to take control of their financial lives, as long as its done in an ethical manner.) Plus, early registrants like me will get a free book. It looks like their will be a lot of overheads and visuals so my kanji skills will help. Of course, I can’t carry on a conversation in Japanese (yet!) so I am nervous about probably being the only non-Japanese person there. As they say, I will keep you posted! I have a week off from school and I plan to spend some quality time with my family and my Iphone. Ipad, Iphone, Isurrendered. Yes, I got an Iphone. I got tired of people telling me that my Palm Treo should be donated to the Smithsonian. I also wanted to have the ability to study Japanese flashcards on the fly. Having an iPhone is like having a little television everywhere you go. (See Don’t Watch TV). I was hanging out with my lovely little family this weekend. We had our Macclaren stroller tuned up (yep, Pimpin’ Our Ride), shopped for pens at Muji, strolled through China town, purchased an iPhone case for my wife, and stopped at an Italian cafe to rest before the train ride home. The whole time I was hanging out with my family, it felt like the iPhone was burning a whole in my pocket. I wanted to check the internet and do my flashcards and I even pulled out for a few swipes. When we got home I got all app’ed up. With a little one year old propped on my lap, I searched iTunes for Japanese learning apps. Then I installed them. The girls wanted to play “put the change back in the giraffe piggy bank” and I obliged, but I kept running back to check on the progress of different downloads, etc. As far as paying full attention to the girls, at that point I was iTuned out. I was feeling the hunger for being able to study Japanese when I was out of the reach of internet. This little program has a dictionary and allows you to look up kanji using several methods, including by school level and by levels of the Japanese Proficiency Level Test (JLPT). This program was recommended by my Japanese learning fellow traveler, Rob. It functions as a J-E, E-J dictionary and also has a ton of sample sentences for each word. If you don’t understand a word in a sentence, you can just touch it and voila–more words to learn. You can also create flashcards for each word. What’s great about the flashcards is that you can hit the little “i” icon and get more information and sample sentences. Sentences are the best way to learn words. Midori has similar functions to the Japanese program. It has sample sentences but I like how the Japanese app allows me to see each individual sentence in larger font. Midori allows you to create flashcards and also has the added bonus of being able to draw kanji on the screen. I like that I can read a book, look up a word and then make a flashcard out of it. After weeks of reading cheesy self-help fair (and loving it! ), I felt a need to wax poetic and I looked up Shakespeare apps. I headed straight towards Hamlet. Even though I just in the first act, I’m already getting the poetic spice my mind was craving. “Disasters in the sun.” Wicked. I have to be careful with the iPhone, both literally and figuratively. A guy in Williamsburg was pushed on to the tracks by two thieves who wanted to take his iPhone while he was reading the Bible. (The Bible!) Luckily he’s okay (and the news explained that the thieves didn’t get away with his iPad). There are also tremendous human costs in the production of creating products like iPods, iPads, etc. as the New York Times has recently pointed out. There’s also just the fact that electronic devices can just take me away. Sometimes, you just have to look up from your apps and look at the balmy February sky! I don’t watch much television but when I do I make sure it is in another language. Picture from one of my stays at a manga kissa. 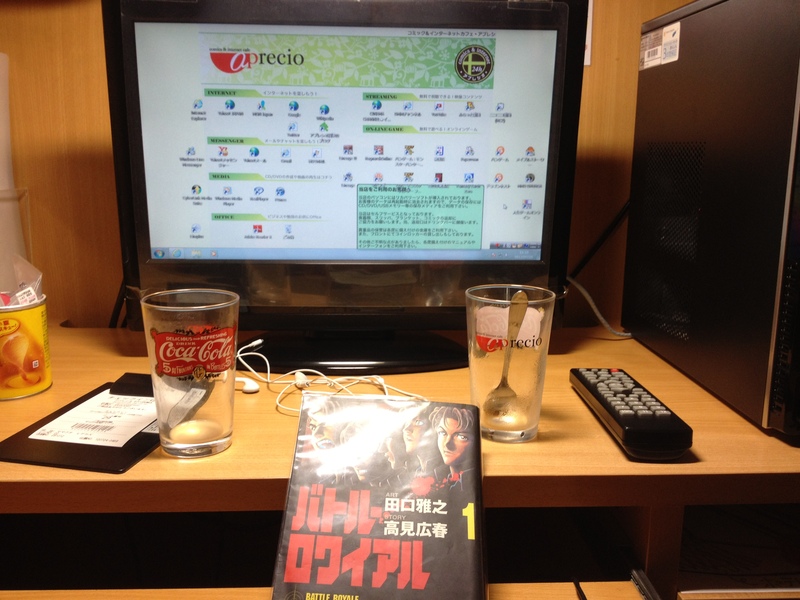 Battle Royale manga, empty glasses, internet and a remote control. Classic! Everywhere I go it seems there is someone or something telling me not to watch television. I guess that’s one of the dangers of reading too many books! If you continue to watch television every day for two hours will you acquire the skills you want? If you watch television, are you going to become the kind of business person you want 5 or 10 years from now? Have you gained any skills from watching television for so long? This is the first paperback version of the groundbreaking work of the self-actualization and brain function scholar. 画期的な自己実現法で話題の希代の脳機能学者が初の新書を刊行! Without knowing it, your brain is being badly influenced [by television]. How can you lead a life without being fooled? あなたの脳は知らぬ間に毒されている! 洗脳のプロフェッショナルが教える「だまされない生き方」とは? Commercials fascinate with their goods while entertainers wear their marvelous fashions and live in their high class apartments while visiting high fashion stores and eating extravagant food. Is this what you really want? Is this the way to lead a happy life?CMに映し出される魅力的な商品、芸能人が着ている華麗なファッション、著名人が住んでいる高級マンション、有名店の豪勢な料理……それらはホントにあなたが欲しいモノですか?幸福な生き方ですか? I know I’ve put a lot of other people’s thoughts in front of you. Kind of like watching television, innit? It’s just strange that all the sudden so many writers are telling me not to watch television. One thing that I have definitely stopped doing is watching the news while we eat or get ready to eat dinner. I don’t know what I was thinking by doing that, especially since I have two young daughters. Do whatever you want. I am just a motivational speaker who lives in a limited equity co-op down by the Hudson River. If you watch television, watch your mind and your results. What are you accomplishing? How are you feeling and thinking? Are you ready to be a samurai unplugged? I am continuing to read I Can by Ben Sweetland. It’s kind of like The Secret but last edited in the 1960’s. Yeah, so retro, it’s cool. :) Right? (Crickets chirping.) Anyway, Sweetland does something interesting. Because he is exploring how to rewire and work with your subconscious, Sweetland asks you to repeat chapters and not move on until you have completed some mind exercises. Daruma from a Temple–According to Squidoo “After the introduction of Zen Buddhism in Japan, Daruma became an extremely important symbol and figure for the Japanese. He represents good luck, perserverance and hard work. 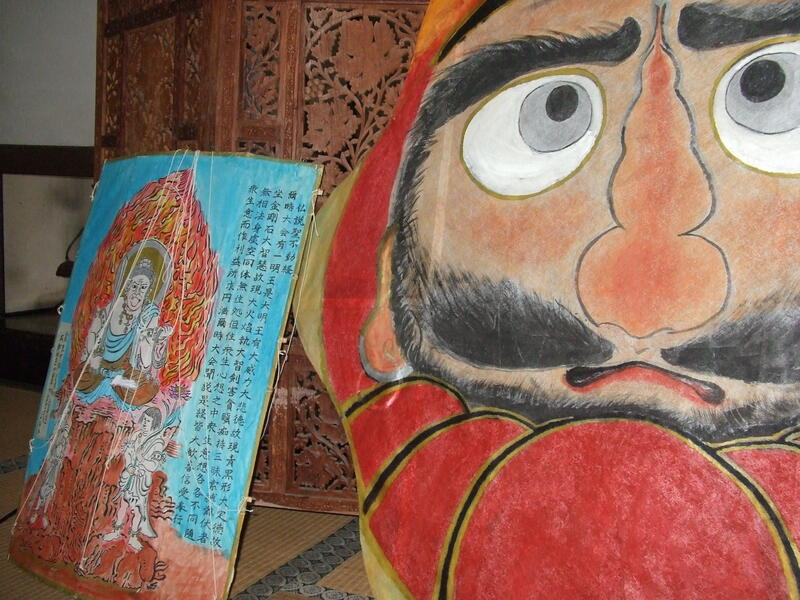 Images, illustration and figurines of Daruma can be seen throughout Japanese culture and homes.” Fun and perseverance! Study what brings you joy. Bring joy to what you study. There are two key elements working here. I’m repeating and I’m having fun. I’m not sure if this officially a cliche but repetition is the mother of all skill. Mindful repetition is one of the key things that I have discovered on my road to trying to learn Japanese, and something I’m starting to use in all aspects of my life. First of all pick the materials and ideas that are fun. Also, when you are studying when you start feeling resentful, tired, bored etc–stop. You can either change modalities, materials, or approaches. I’m talking about studying materials that you have chosen for your self. I’ve also found that it is possible to change your attitude and re-frame your attitude as you study. For example, I was reviewing my Samurai Notebook and looking at some of my goal exercises. I realized that I was doing it listlessly. I stopped for a second and thought: “What if I really breathed and imagined all of these goals.” It made review a whole lot more interesting. My mantra is now, “If you repeat, you must delete.” If something in your notebook or SRS becomes dull or was never interesting to begin with, get rid of it or cross it out in your notebook. It becomes a drag on your mind and your motivation to keep on studying and learning. This idea really jelled for me because Khatz at Ajatt.com keeps hammering the message of fun and the importance of deletion. Study what brings you joy. Bring joy to what you study. If you repeat, you must delete. Repeat. Have fun. The world smiles when you become you.